Montpelier is an unincorporated community in eastern Muscatine County, Iowa, United States. Located along Iowa Highway 22, it lies on the Mississippi River above the city of Muscatine, the county seat of Muscatine County. Its elevation is 568 feet (173 m). The community is part of the Muscatine Micropolitan Statistical Area. The first settlers were of Muscatine County were natives of Vermont, and they chose the name after the capital of that state, Montpelier. Montpelier's post office was first established under the name of Iowa on April 19, 1836, changed to Montpelier on April 1, 1839, and discontinued on February 11, 1846. Although it was reestablished on February 28, 1882, it was finally discontinued on February 18, 1986, when it was attached to the Blue Grass post office. Although its post office is gone, Montpelier retains its own ZIP Code, 52759. ^ a b "Montpelier, Iowa". Geographic Names Information System. United States Geological Survey. ^ Richman, Irving Berdine (1911). History of Muscatine County, Iowa: From the Earliest Settlements to the Present Time. S. J. Clarke Publishing Company. p. 210. 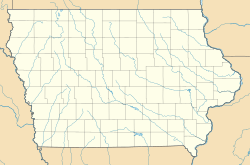 This article about the geography of Muscatine County, Iowa is a stub. You can help Wikipedia by expanding it. This page was last edited on 15 January 2018, at 02:48 (UTC).